There are few things that reveal the priorities of a government better than a national disaster. In Zimbabwe, Cyclone Idai, which had left at least 65 people dead and more than 100 missing in its wake by Sunday, has once again raised questions on the country’s disaster response. The DCP, which requires experts and constant training, was allocated just $88,000 for staff costs. For goods and services, the DCP only has $68,000. While there is an allocation of $1 million for maintenance of State Residences, the DCP only got a tenth of that, with an allocation of $108,000 for maintenance. For the DCP, there is an allocation of $100,000 for capital expenditure, which is not enough to by the fully kitted out, high spec 4X4s for the unit’s purposes. Compare that with $3.4 million, the allocation granted by the government for a vehicle loan scheme for chiefs. From that $2.36 million, the DCP is expected to run an effective early-warning system, to push extensive communication campaigns, to coordinate the evacuation of people in harm’s way and to lead rescue efforts in times of crisis, such as Cyclone Idai. All from a budget that is a fraction of what we are spending on chiefs. Last year, DCP director Nathan Nkomo said the unit “is operating on a shoestring budget”. To function properly, the DCP needed an allocation of at least $10 million a year, he was quoted as saying. 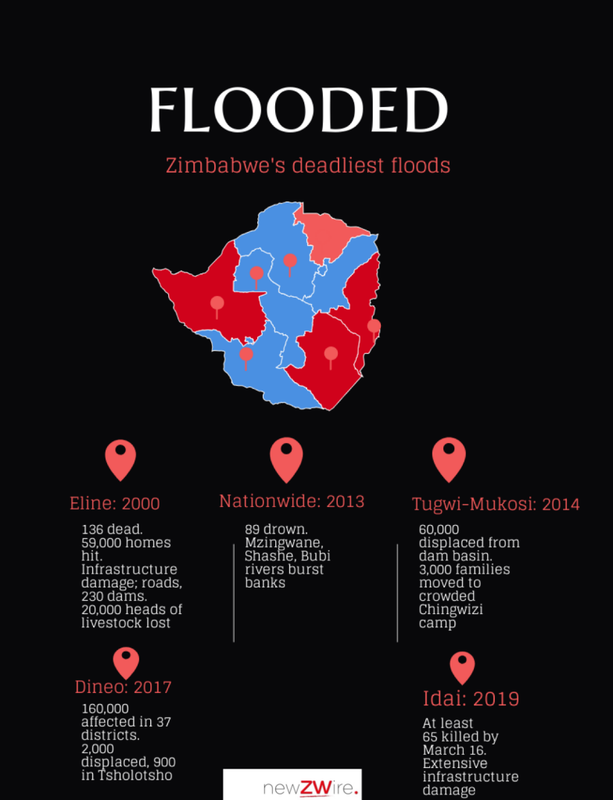 Zimbabwe has experienced serious floods over the past two decades. In 2000, Cyclone Eline devastated parts of the country, claiming 136 lives and destroying tens of thousands of houses. Each time, the disasters have left deaths and significant damage to infrastructure in their wake. However, the government’s response has not improved after each crisis, as one would expect. However, a line in the Blue Book, the Treasury record of expenditure, shows how badly DCP is doing on that score. For 2017, under the performance indicator of “psychological trauma support as a proportion of highly traumatic events”, the DCP scored only 10%. In other words, the DCP did not go back to help people affected by floods to pick up the pieces and get on with their lives.